Trumpy Bear Returns With #QAnon Tagline [VIDEO] - Joe.My.God. When I first reported on Trumpy Bear back in July 2017, some believed it to be a satire of Trump cultists. That wasn’t so and now it’s even batshittier. Trumpy Bear becomes more sinister if you understand its origins. The ad begins on an ominous note. “A storm is coming,” a husky voice says. “You cannot defeat the storm. I am the storm.” What does a storm have to do with stuffed bears? The answer is disturbing. Those words are the slogan used by QAnon conspiracy theorists, who believe Trump is a heroic figure fighting a secret network of pedophiles that control Hollywood, the Democratic Party, and the so-called Deep State. 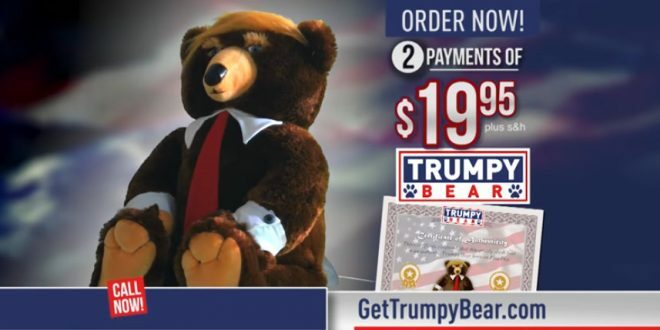 The Trump Bear is the cuddly avatar for one of the most unhinged factions of American political life.